Hakone is a quiet town in Fuji-Hakone-Izu National Park, popular as a day trip for Tokyo residents looking to escape the city. The natural beauty here is overwhelming, with soaring hills, thick cedar forests and an inspiring view of Mt. Fuji. 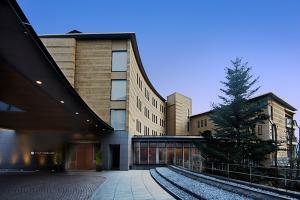 Gora, Japan Our 5-Star classification designates those select properties that provide exquisite service and amenities. The discriminating traveler will find the accommodations, ambiance, dining, and staff assistance of the highest caliber. These properties offer the utmost in luxury and will provide an outstanding experience. Enjoy a view of Mt. Fuji at this comfortable hot springs getaway.